Queenstown is a resort town in Otago in the south-west of New Zealand’s South Island. It has an urban population of 14,300 (June 2016), making it the 27th largest urban area in New Zealand. In 2016, Queenstown overtook Oamaru to become the second largest urban area in Otago, behind Dunedin. 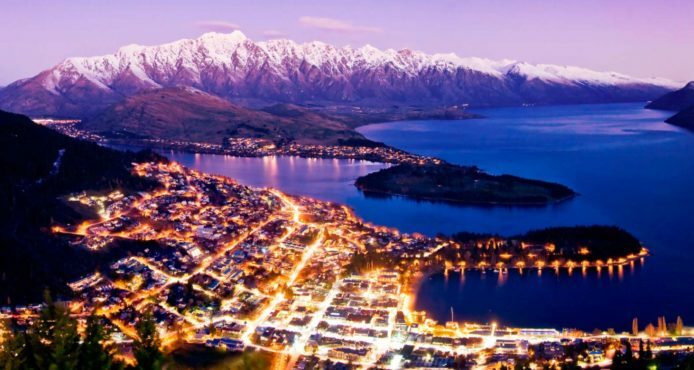 The town is built around an inlet called Queenstown Bay on Lake Wakatipu, a long thin Z-shaped lake formed by glacial processes, and has spectacular views of nearby mountains such as The Remarkables, Cecil Peak, Walter Peak and just above the town; Ben Lomond and Queenstown Hill. The Queenstown-Lakes District has a land area of 8,704.97 square kilometres (3,361.01 sq mi) not counting its inland lakes. The region has an estimated resident population of 34,700 (June 2016). Its neighbouring towns include Arrowtown, Glenorchy, Kingston, Wanaka, Alexandra, and Cromwell. The nearest cities are Dunedin and Invercargill. 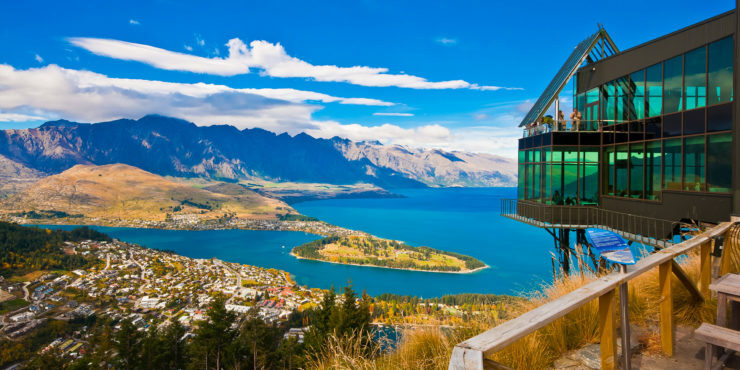 Queenstown is known for its commerce-oriented tourism, especially adventure and ski tourism. The area was discovered and first settled by Māori before non-Māori arrived. The first non-Māori to see Lake Wakatipu was European Nathanael Chalmers who was guided by Reko, the chief of the Tuturau, over the Waimea Plains and up the Mataura River in September 1853. Evidence of stake nets, baskets for catching eels, spears and ashes indicated the Glenorchy area was visited by Māori. It is likely Ngāi Tahu Māori visited Queenstown en route to collect Pounamu (greenstone). There was a settlement called Te Kirikiri Pa occupied by the tribe of Kāti Mamoe which was situated in the location of the current Queenstown Gardens, but by the time European migrants arrived in the 1860s this settlement was no longer being used. European explorers William Gilbert Rees and Nicholas von Tunzelmann were the first non-Maoris to settle the area. Rees established a high country farm in the location of Queenstown’s current town centre in 1860, but the discovery of gold in the Arrow River in 1862 encouraged Rees to convert his wool shed into a hotel named the Queen’s Arms, now known as Eichardt’s. Many Queenstown streets bear names from the gold mining era (such as Camp Street) and some historic buildings remain. William’s Cottage, the Lake Lodge of Ophir, Queenstown Police Station, and St Peter’s Anglican Church lie close together in a designated historic precinct. Subsequent to this a public meeting was held for the purpose of naming the township on the lake in January 1863 in which the town was officially given the name of Queenstown in reference to Ireland’s Queenstown. By 9 and 10 January 1863 the town was being reported with the name of Queenstown from several reports written by a correspondent in the Otago Witness on Monday the 5th and Tuesday the 6th. It was during the meeting there may have been a reference by a miner of the town being «fit for a Queen». Queenstown is a major centre for snow sports in New Zealand, with people from all over the country and many parts of the world travelling to ski at the four main mountain ski fields (Cardrona Alpine Resort, Coronet Peak, The Remarkables and Treble Cone). Cross country skiing is also available at the Waiorau Snowfarm, near Cardrona village. The 100-year-old twin screw coal fired steamer TSS Earnslaw traverses Lake Wakatipu. Queenstown lies close to the centre of a small wine producing region, reputed to be the world’s southernmost. The Two Paddocks vineyard is owned by local actor Sam Neill. Neighbouring, historic Arrowtown features restaurants and bars. Queenstown has many festivals. In 2013, examples include Bike Festival (March/April), Winter Festival (June), and Jazz Festival (October).